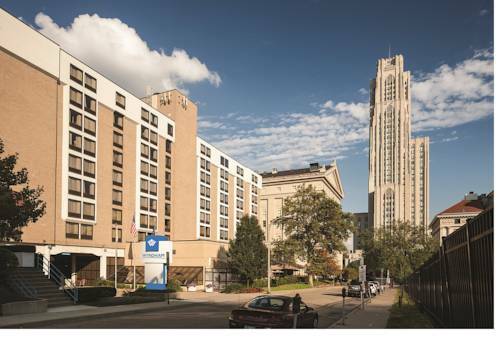 With an enviable location in the heart of the medical and educational district, and just steps from Carnegie Mellon, the University of Pittsburgh and several world-renowned hospitals, the Wyndham Pittsburgh University Center combines convenience and service for an exceptional experience. The Amtrak station and Pittsburgh International Airport are also within easy reach of this hotel as are sports arenas and corporate offices. Wind down or work out in the heated indoor pool and fully-equipped fitness center and enjoy a complimentary shuttle to local destinations. A sunny, spacious onsite restaurant serves all meals and room service. Meeting facilities and a dedicated staff can accommodate small or large gatherings. Rooms feature bathrobe, flat-screen TV, MP3 dock, pillow-top mattress and ergonomic work station, and select rooms are available with refrigerator.